After our tiring 2nd day, it was finally time to do some water adventures! 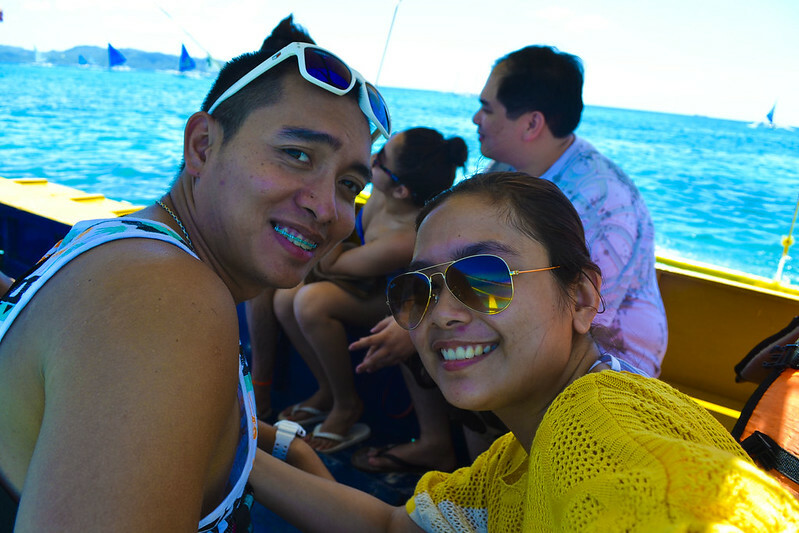 We psyched ourselves to wake up really early in order to cover all the activities (reef walking, parasailing, island hopping, etc). Me: Baka maglakad na naman tayo ng walang katapusan ah! Ayoko na. Ian: Hindi na, nakakapagod! Saka ano ‘to, walking tour?! 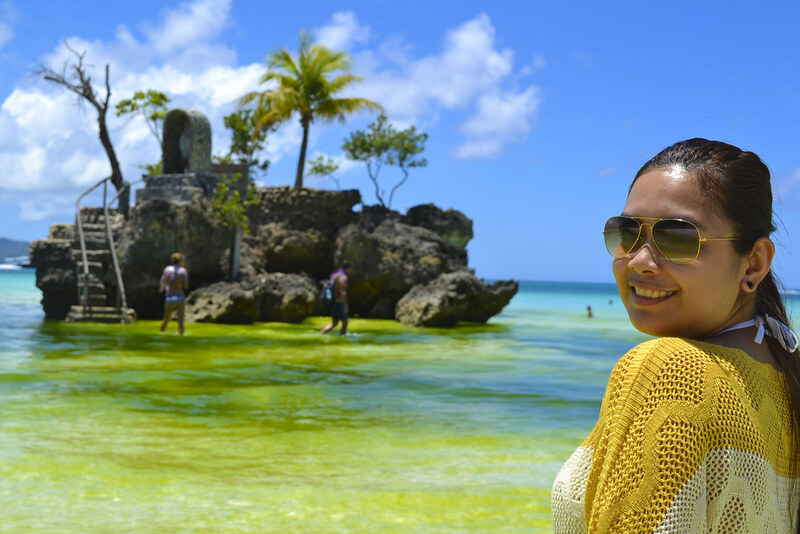 Can you see the thick amount of moss/lumot kissing Boracay’s infamous white sand shore? 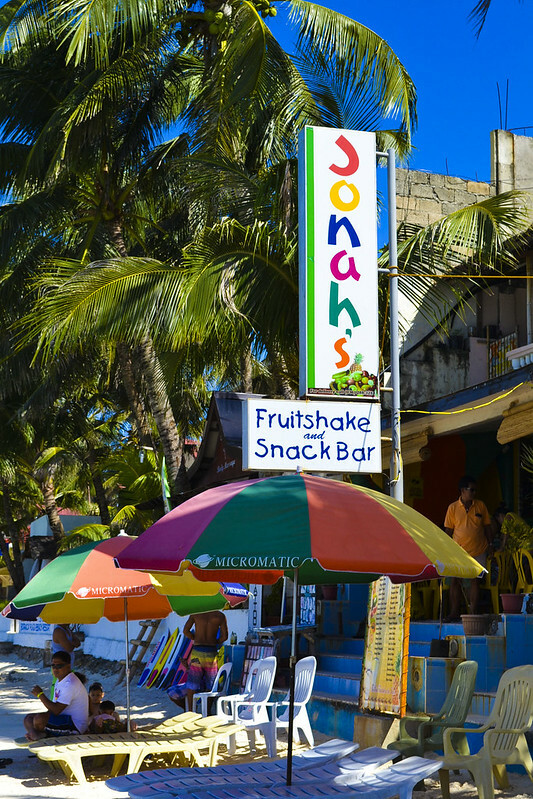 Before going to Boracay, I read a lot of raves about Jonah’s Fruitshake & Snack Bar. 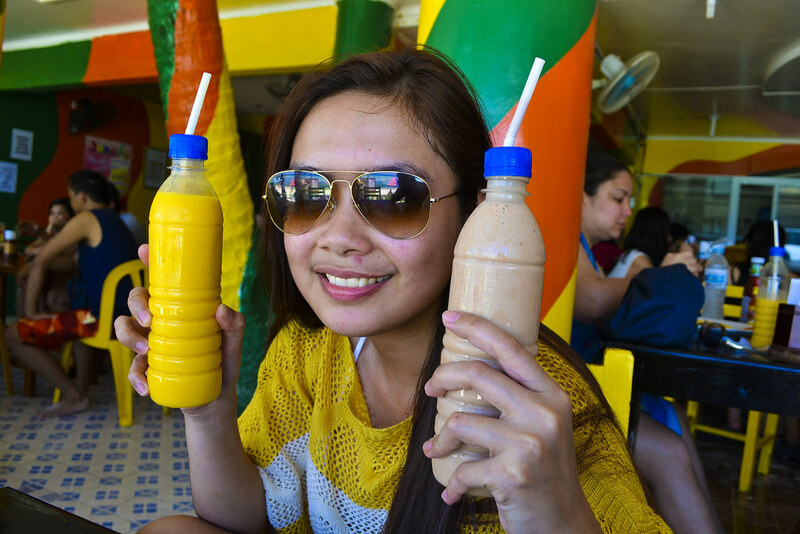 Super sarap daw kasi ng milkshakes nila so we made sure we had time to drop by and try it ourselves. b) claim our free 30mins. massage voucher (c/o TravelOnline) at the nearby Nigi Nigi massage center. Our view while having breakfast. Ah priceless! 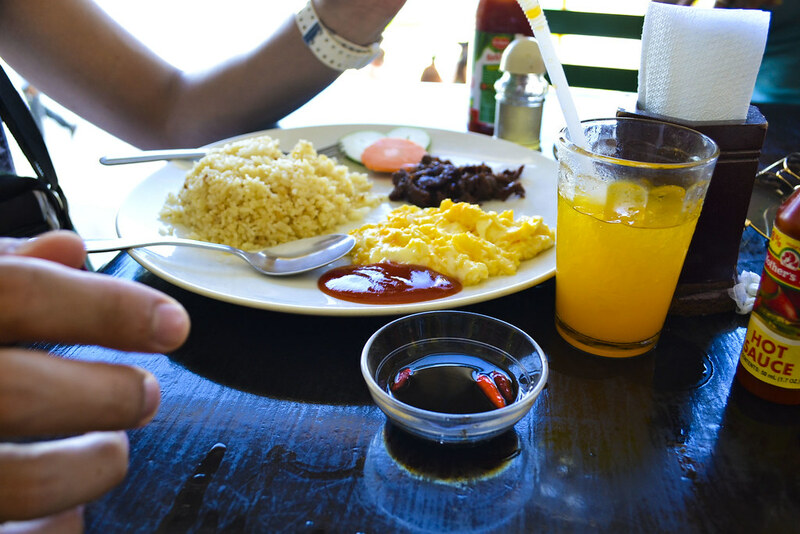 Tapsilog for Ian and dasilog for me (not in picture) Verdict? Ok lang. 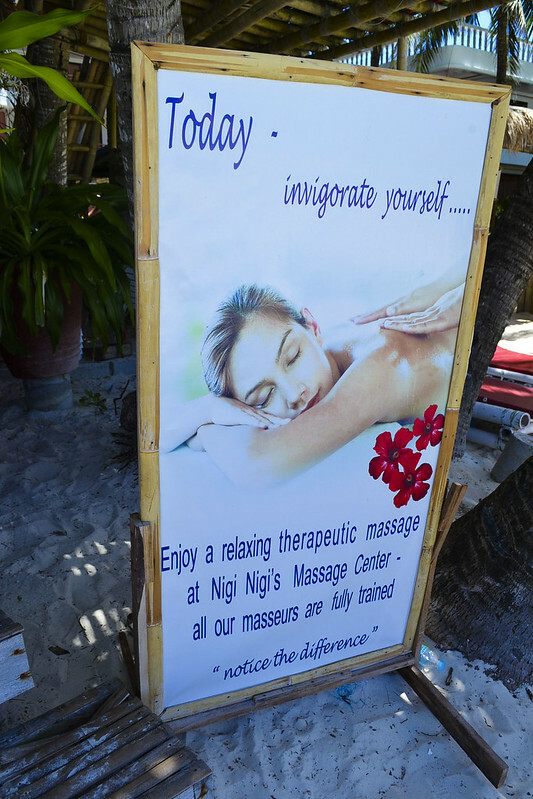 After breakfast, we headed straight to Nigi Nigi to claim our free full body massage. Here’s a confession: First time ko magpamassage! And after that, I don’t think I ever had another massage again. hahaha Hindi naman sa ayoko pero parang nakakaguilty to have someone else pamper you like that. Parang hindi ko deserve. There weren’t many people that morning so I had ample time to stay by the altar and quietly say a prayer of gratitude. However simple the structure is, its background definitely made up for it! 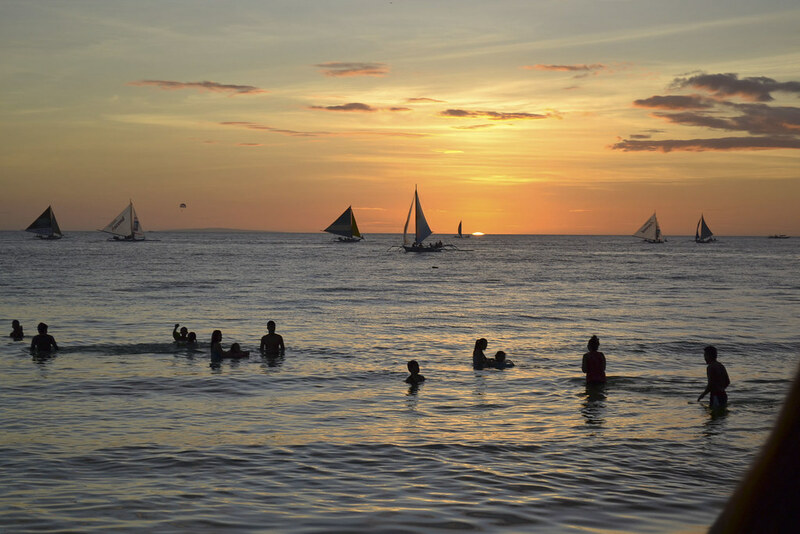 You haven’t been to Boracay if you don’t have a photo like this one. lol! 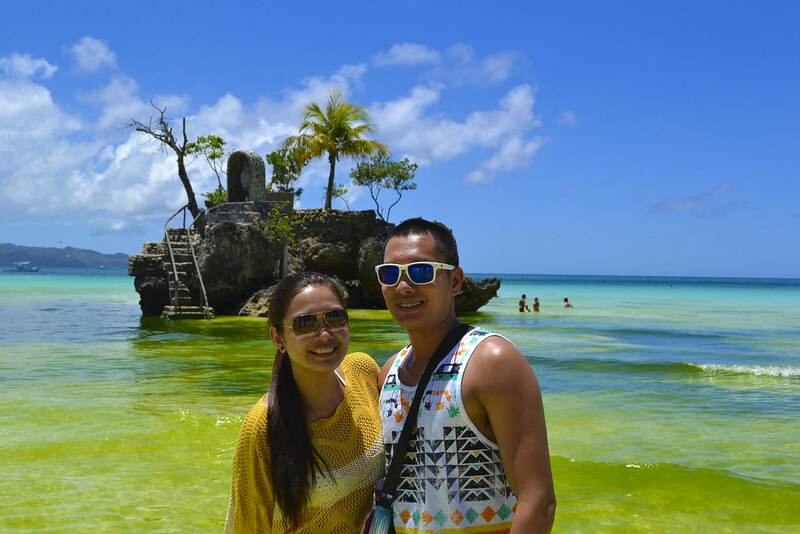 A foreigner saw us struggling to take a good shot together so he kindly volunteered to take this one. Came out really nice! 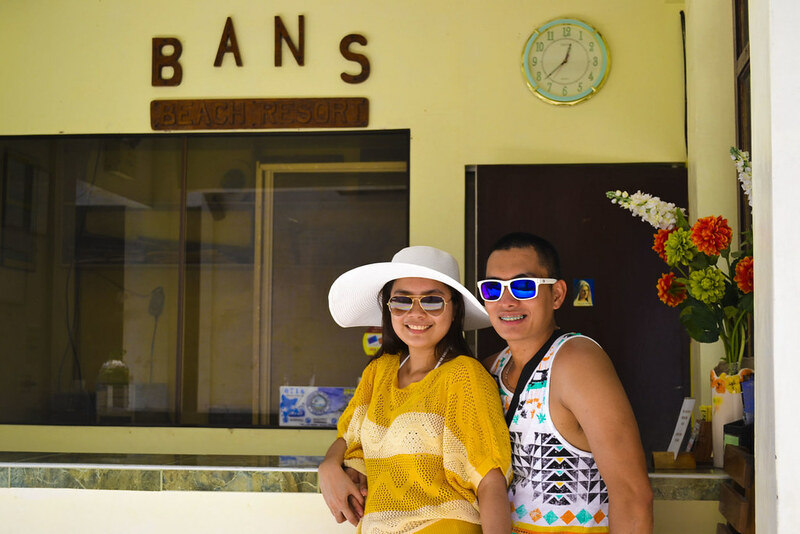 We briefly went back to the hotel to freshen up and ask them for any recommendations on trustworthy tour companies. 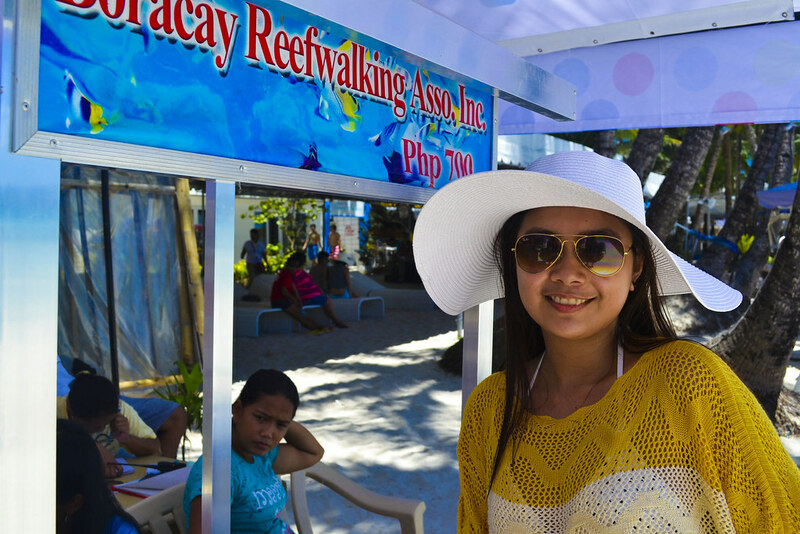 They kindly referred us to Boracay Reefwalking Association which also took care of our parasailing experience. 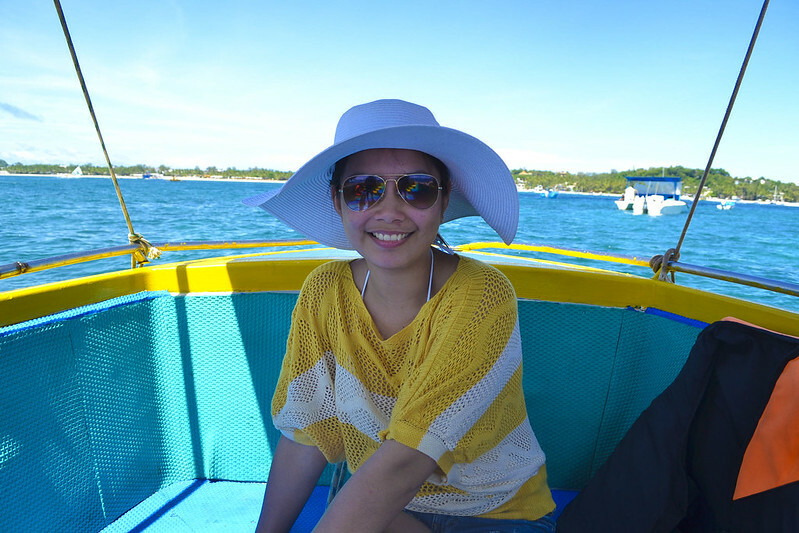 They also contacted a boatman who would take us to a 3-hour island hopping gig in the afternoon. 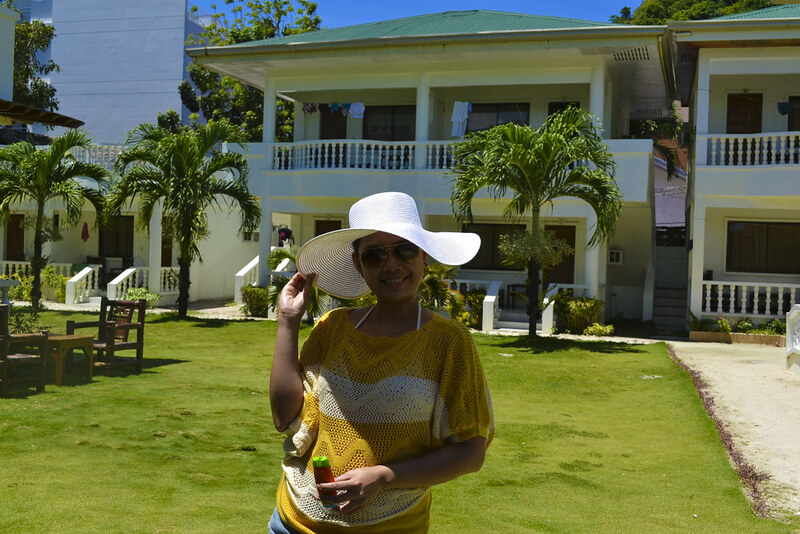 sunblock sunblock din ‘pag may time! 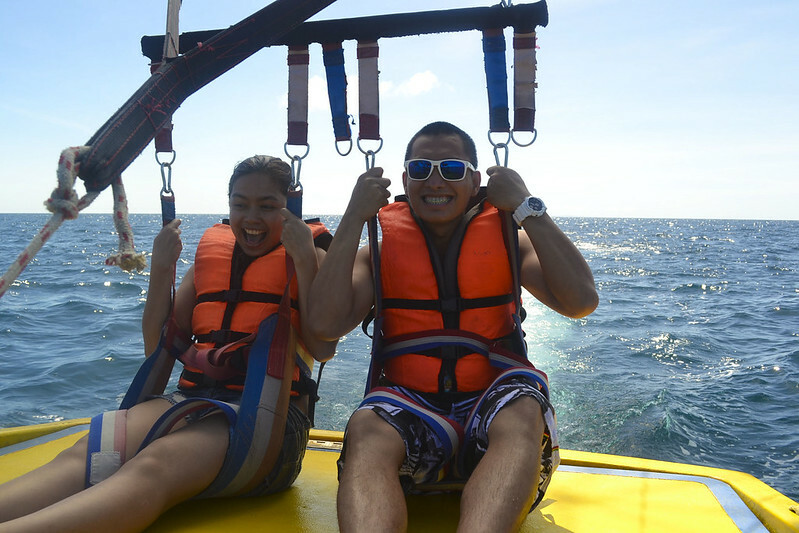 Both excited, we approached the nearby booth and signed-up for two water activities — Reefwalking/Helmet Diving (PHP700/pax) & Parasailing (PHP750/pax). 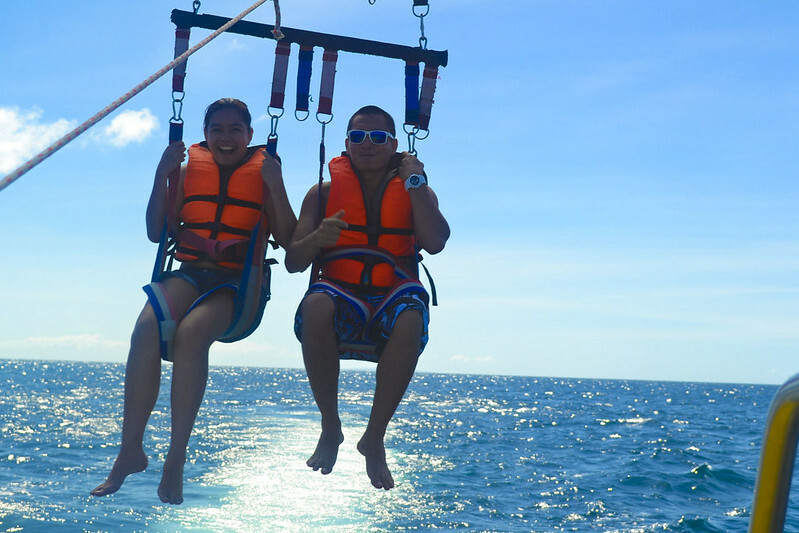 After payment, we were asked to sign a waiver confirming that we were healthy & ‘brave’ enough to do such extreme activities! Me: Pa’no kung maiwan tayo ng bangka habang nasa ilalim tayo ng dagat?! What if we encounter a shark? Pa’no kung mag-snap yung tali ng parachute? Ian: Andami mong problema. Dahil yan sa kakanuod mo ng ‘I Shouldn’t be Alive’! After sometime, I got a little relaxed. However, there was another problem. I GOT SEASICK! 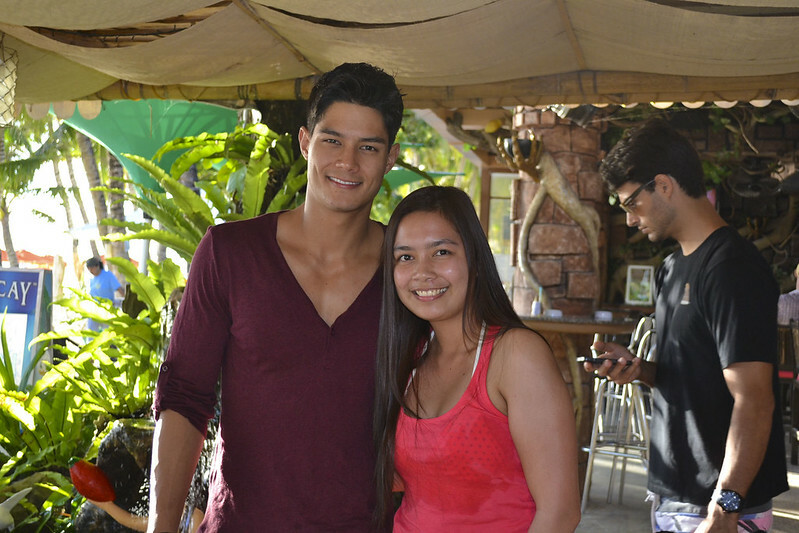 Grabe, I was so dizzy I couldn’t enjoy the moment anymore. To think this was before we started any of the activities ha. 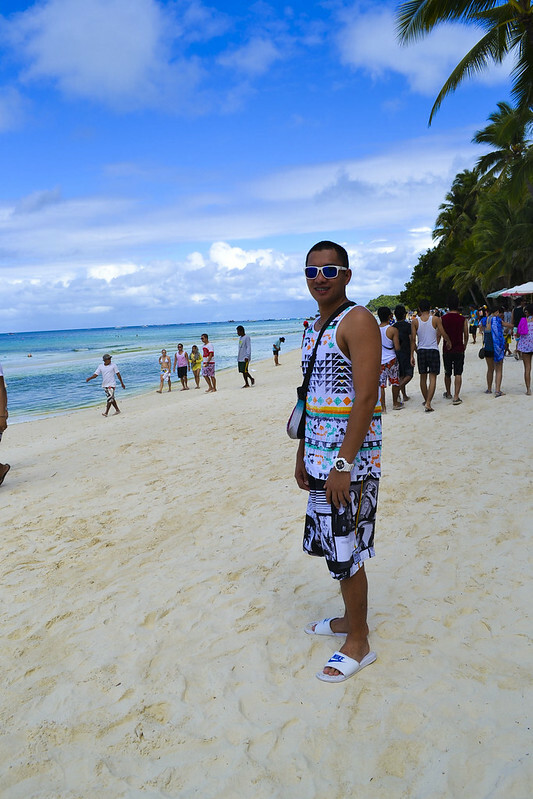 Bad trip talaga ‘coz I was looking forward to the experience but the dizziness took over the anticipation. It was actually way worse than a bad hangover. Tsk tsk! 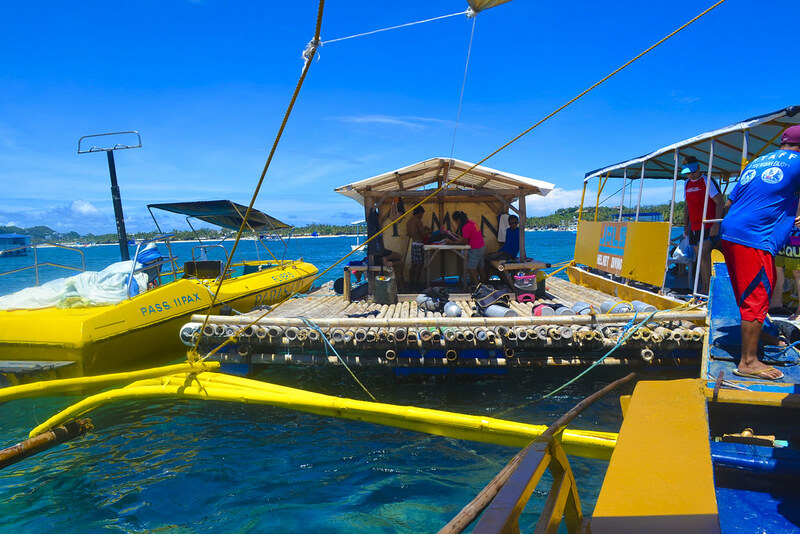 After around 15 mins., we finally reached the diving spot where a floating platform, more like a wooden raft or balsa, was waiting. We were instructed to transfer to the platform & waited for our turn to be briefed. The wooden platform which served as our base/waiting area. 2. The helmets were really heavy! If I remember correctly, each weighs around 25-30kg. Reason for this is to help it stay in place while under water. It will also keep you from floating! They will feel lighter once you go down the ladder. 3. 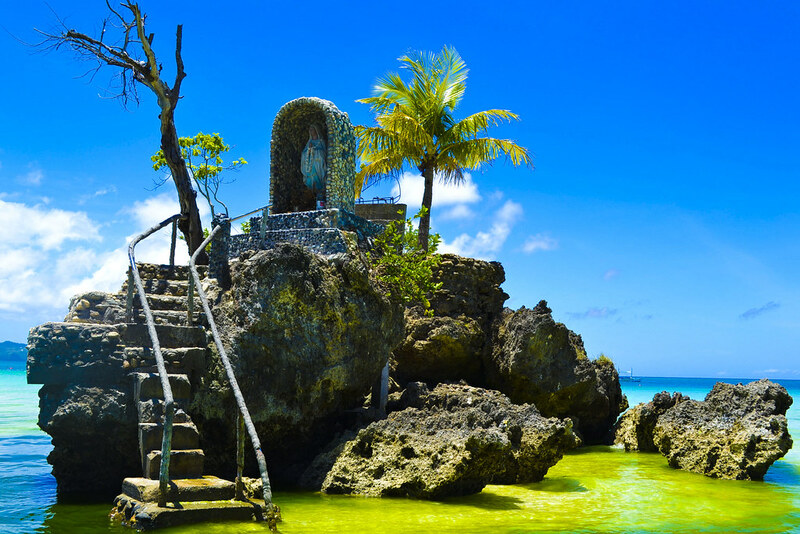 To reach the sea bed, you’ll have to descend for about 15-20 feet. No worries though, the instructors will teach you how to relieve the pressure (Pinch your nose then blow as hard as you can). 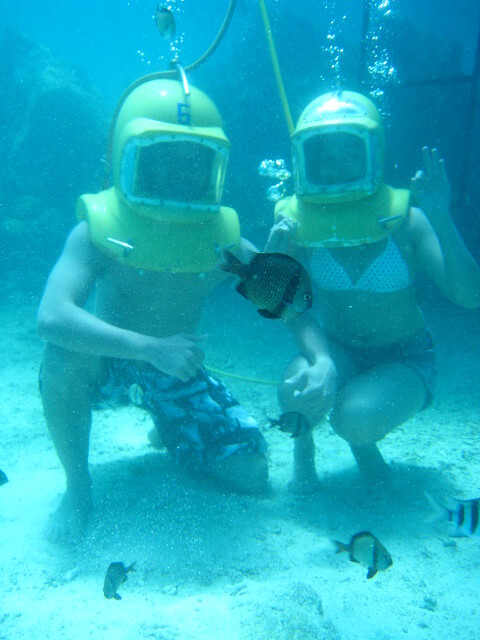 FYI, you can still very much breath normally while under water. 4. Since talking is not possible, you will have to use some hand signals to communicate underwater. 5. 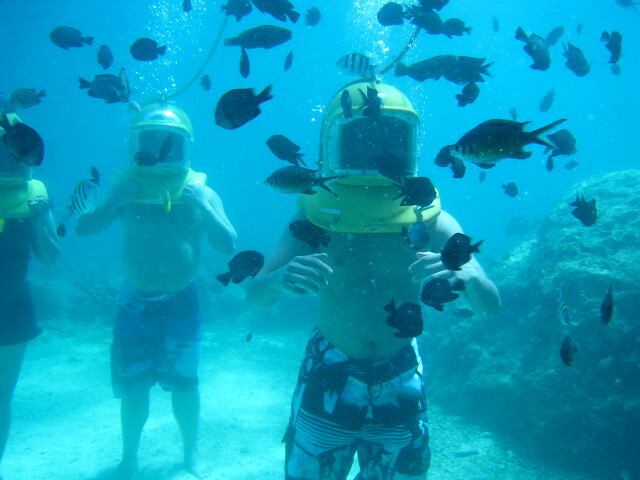 It is so called reef walking because you will actually walk and not swim (unlike scuba diving). Throughout your 15 mins. stay, you will be given pieces of bread to feed the fish. 6. 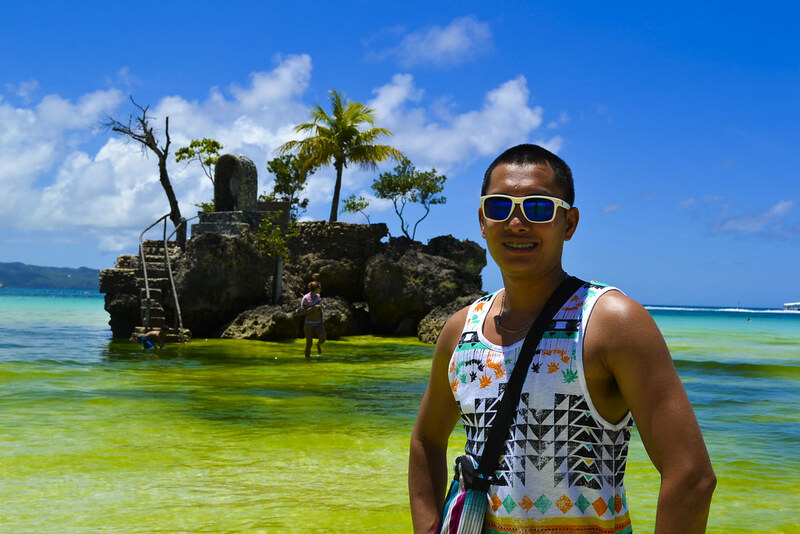 Don’t worry about documenting your experience because the package already includes photos & videos taken by the guide(s)! In summary, the whole experience was surreal. 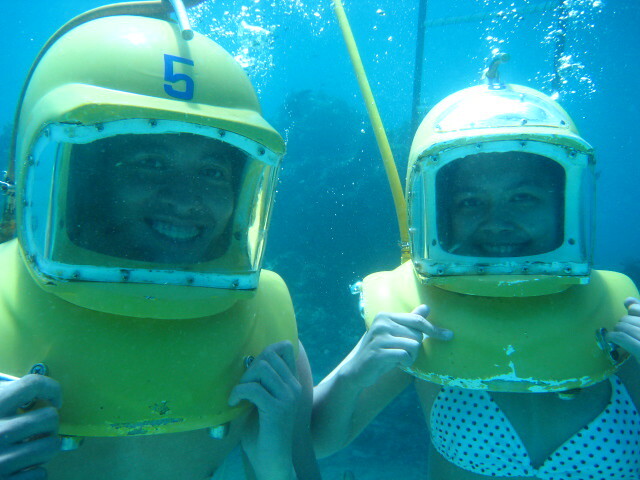 All the inconvenience and paranoia were all worth it as we got to meet and feed the fishes like we were one with them. 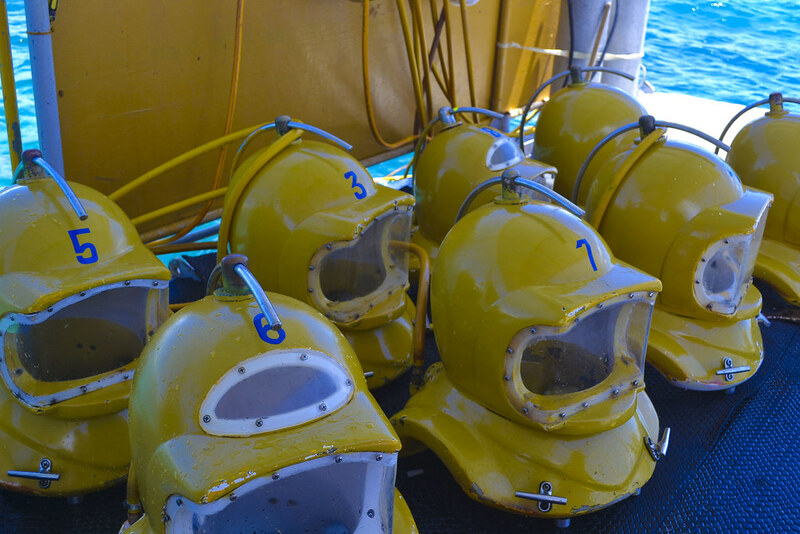 From the bottom of the ocean, it’s now time for us to fly (well, sort of)! 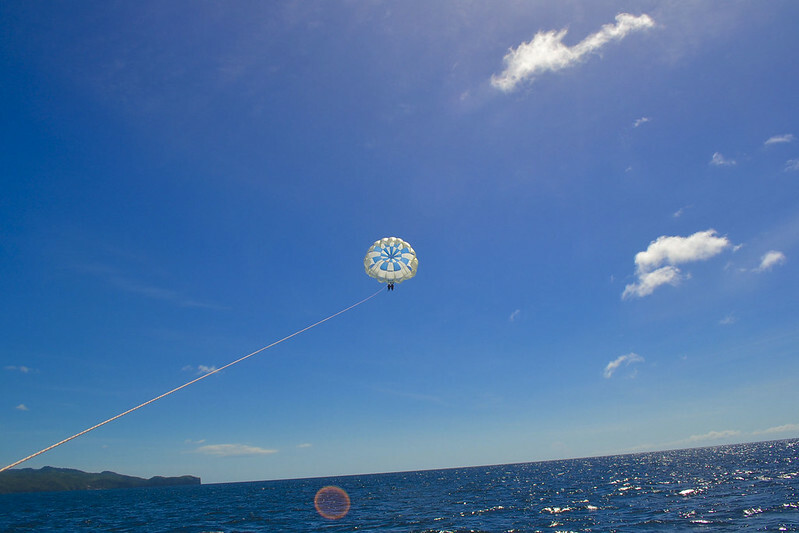 We were taken by another boat to the parasailing site and briefed us on the do’s and dont’s. I was feeling a lot dizzier already, hence I just wanted to quickly get it over and done with. 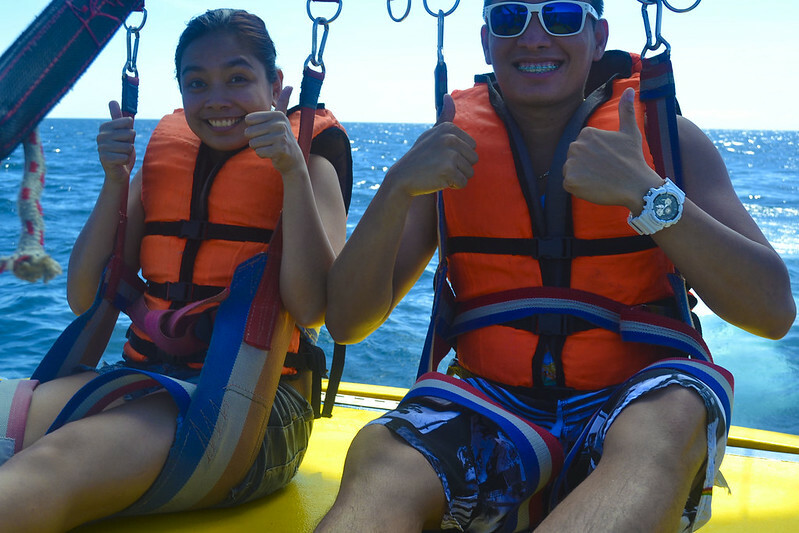 Syempre I couldn’t back out naman kasi sayang yung binayad namin and I didn’t want to deprive Ian of the experience. Smile muna kahit hilong hilo na! Waah! 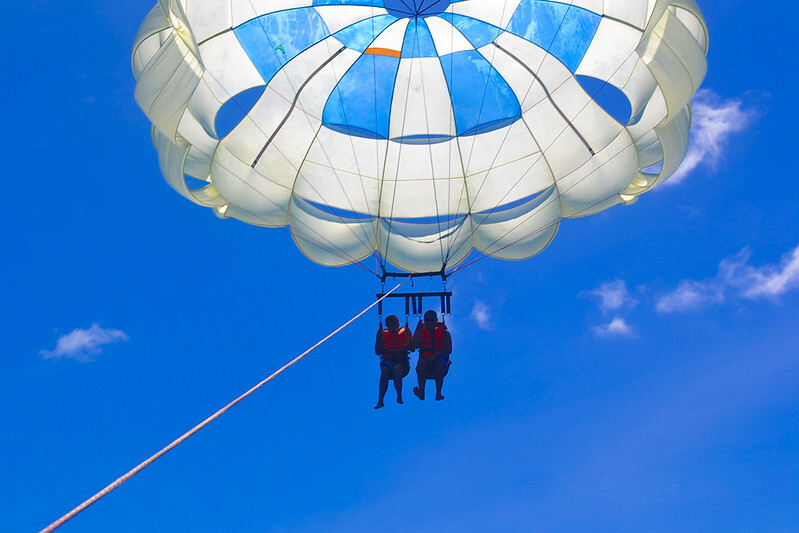 They then securely strapped us to the parachute and slowly loosened the string sending us higher and higher and higher! Letting go of the ground was scary and liberating at the same time. 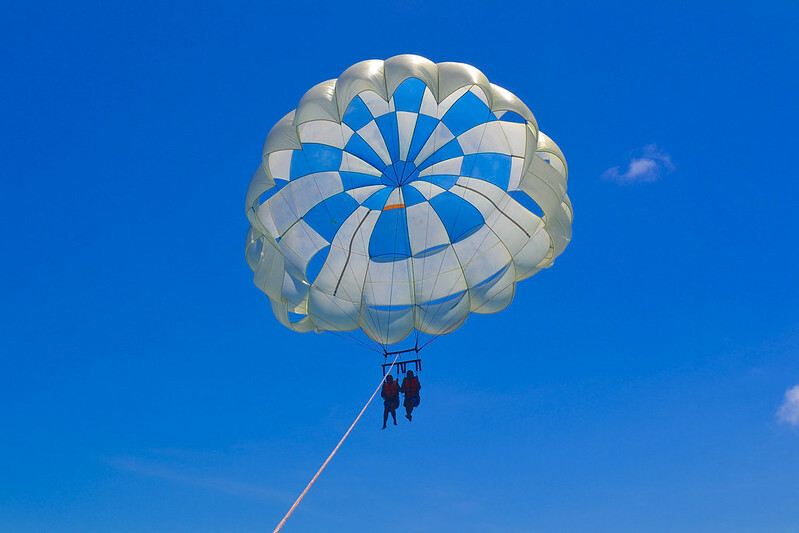 Scary, because we didn’t have any choice but to let go and trust that the parachute was strong enough to keep us safe. 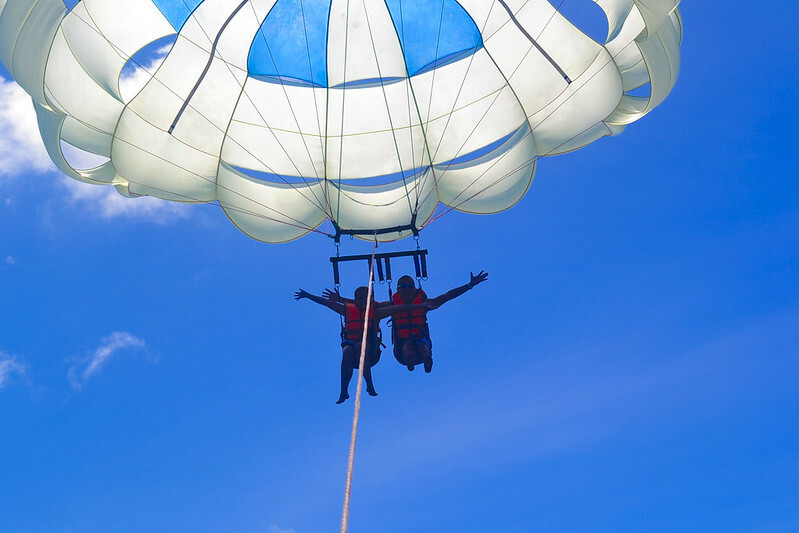 Liberating, because when we did let go, we were able to soar high and see the world in a different perspective. Ian: Baby, tingnan mo ang ganda noh? Me: Wag mo kong kausapin. Nahihilo ako. Baka masuka pa ko dito. Ian: Sana huwag muna nila tayo pababain. 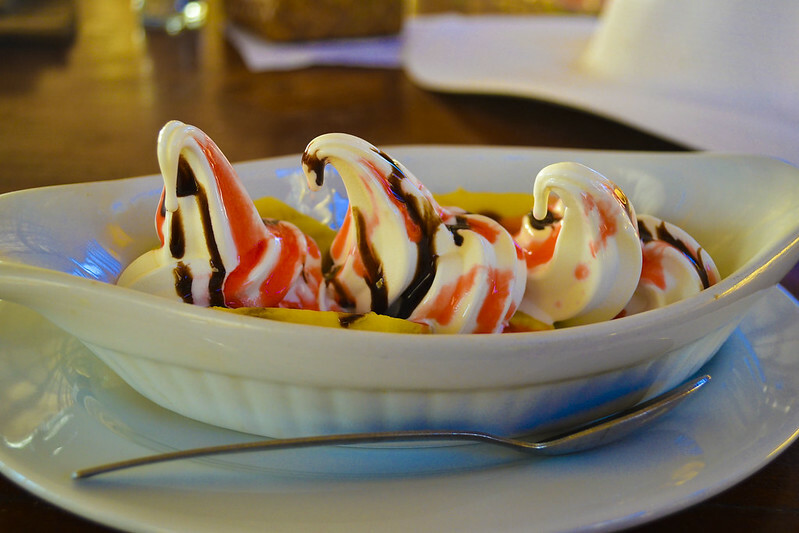 Minsan lang ‘to mangyari e.
Me: Anong ‘wag muna pababain? Ayoko na! Ibaba nyo nako please!!! Ian: Ikaw na ang KJ! 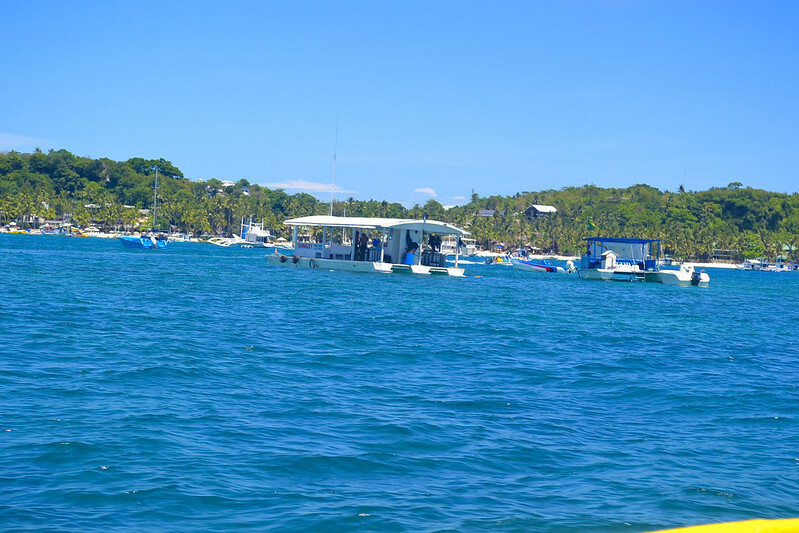 We were supposed to go island hopping in the afternoon but since I was so dizzy, we cancelled it nalang. Too much for sea sickness. Hay. 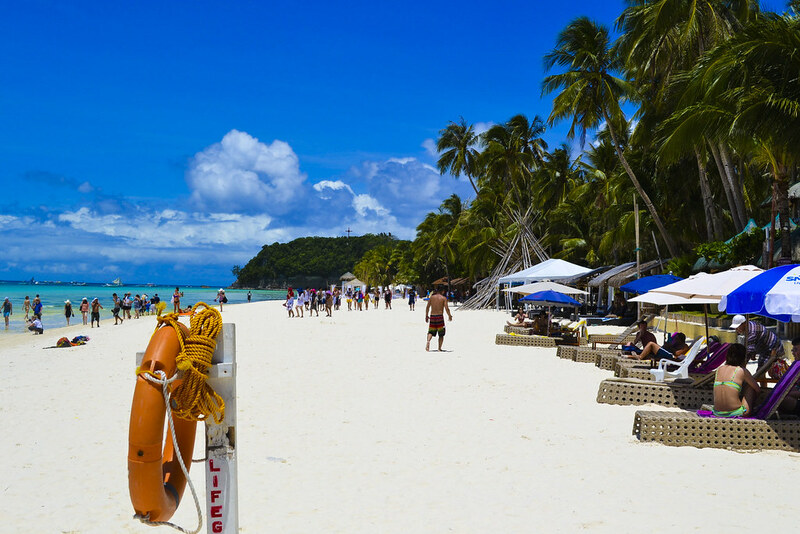 So more or less, this wraps up our 4 days & 3 nights stay in Boracay — definitely one of the most beautiful islands in the Philippines. 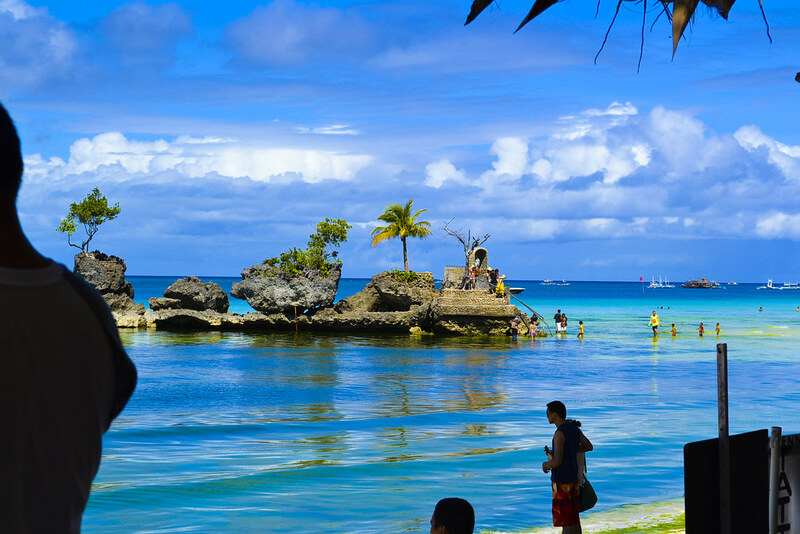 Posted in getaways, Love, PhilippinesTagged Bans Beach Resort, boracay grotto, BOracay Itinerary, Boracay Philippines, Boracay Station 2, nigi nigi, Parasailing in Boracay, reefwalking in Boracay, travel online ph, Travelonline.ph, Water activities in Boracay, What to do in Boracay, Where to go in BoracayBookmark the permalink.